This is really cool, being able to run Windows on any iOS device including iPad and the iPhone! Parallels recently released Desktop 6 for the Mac which lets you run a Windows (virtual) machine on a Mac. A new update was reported for the Parallels Mobile which includes the software now available for the iPad and the iPhone too. Parallels Mobile also lets you connect up other Windows machines and also lets you do a whole range of functions including running Windows presentations and also taking print outs. Parallels has a video that is shown below which demonstrates how the Parallels Mobile works on an iPad. It is really interesting to see Windows 7 respond to touch although Parallel is doing all the magic. 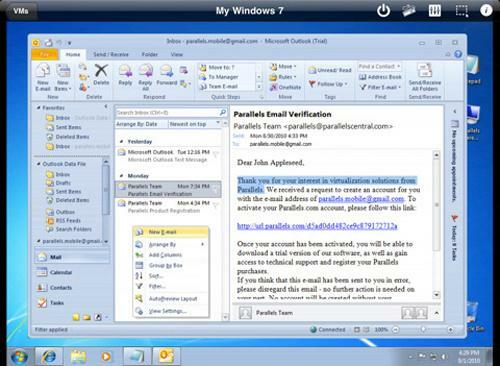 Be advised that you need to be a Parallels user on a desktop to be able to use this. The app however is free but the desktop version is not. If you already use Parallels desktop you can grab the app from here. First HTC Windows 7 phone info leaked – Pictures inside! Windows 8 to Crush Mac OS!